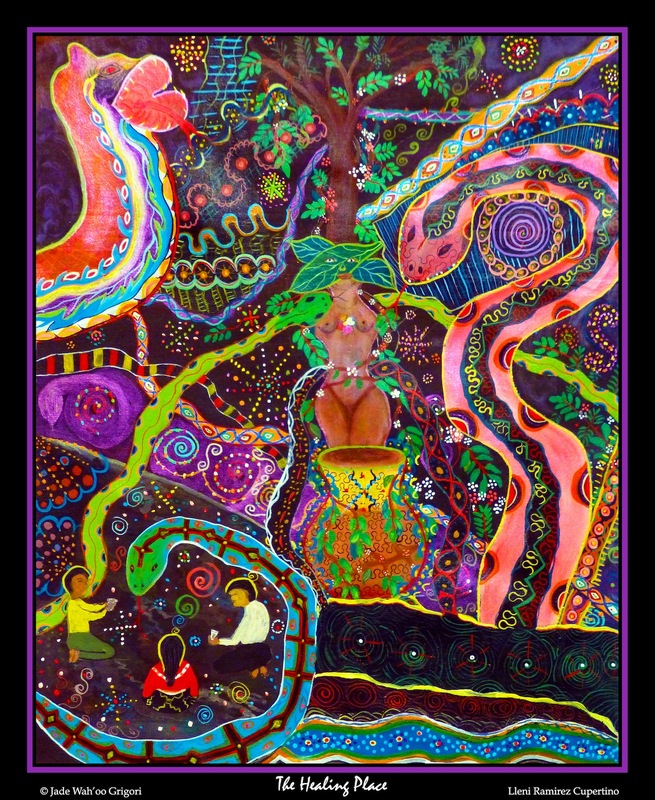 Ayahuasca is a potent psychoactive brew of herbs indigenous to the Amazon Basin. Commonly referred to as the Vine of the Soul, it is a combination of a basis of two plants: the liana vine and the viridis, or chakruna, leaf. 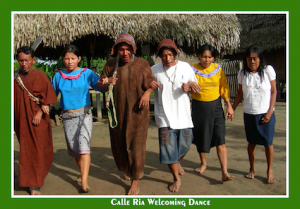 It has been utilized since time immemorial by the tribal peoples of the Amazon for spiritual enhancement, treating dysfunctional states of mind and addictions, and to gain immense personal insight into one’s own internal psychic make-up. While the brew is available in secret enclaves in the US and other Western nations, I myself had awaited the right time, place and guide for my first Ayahuasca Journey. Careful consideration, prayer and trust of the good word of a fellow Shaman who had experientially researched the opportunities, and Ayahuasceros, in the Amazon, led me to accept this as the right choice. I was to be affirmed of this many a time in the next few nights. Night fell. We were called to gather in the larger tent. 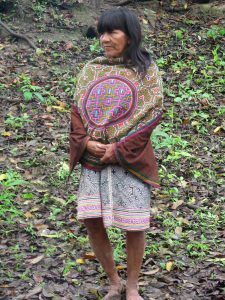 Carlos, the Shipibo Ayahuascero who is to be our guide, sits upon the mat and blanket covered ground, setting out his rattle, tobacco pipe and the sacred brew that we were to shortly imbibe. Gilber sat to his right, fetching and observing, assisting us to find a place to sit so that we formed a rough circle. There we sat: Carlos, then to his left, Alan, David, myself, Maitreya, Stephen, D’Ann and then, making a full circle, Gilber. Gilber’s son-in-law, Roberto, remained outside in a hammock. Carlos held a bottle of brew the color of latte’, the color of the river running by outside our tent. He blew a whistling sound across the jug, and then poured a measured amount into a cup made of gourd. Holding it slightly aloft he spoke, in his native tongue, an obvious prayer, then drank the brew down in a gulp. He then said, with Gilber interpreting into English, that we should each, upon receiving the gourd; make a prayer as to the type of experience we chose. Studying us each with a discerning eye, Carlos then poured into the gourd an amount of Ayahuasca that he determined, in his own mysterious manner, was the dosage appropriate for each individual, whistling a prayer/song over each cup before passing it to the intended person. I watched as the faces of those quaffing their drink before me wrinkled up in a contorted gesture of distaste. I received the brew Carlos offered me, held it aloft to the Spirits who take care of me, asking for their participation in this sacred rite, asking their companionship upon this journey into the Soul upon which I was to embark, then set the prayerful intent of a beautiful experience. I drank the bitter brew, my own face contorting as those before me had done, and then handed the empty cup back to the Ayahuascero. Each in our turn drank, partaking of the sacrament that we had traveled so far to imbibe. After each person had drunk of the potent hallucinogenic brew Carlos knelt over our bent head and blew a puff of tobacco, drawn from his hewn wooden pipe, into the top of each our heads, a prayer of blessing and protection, a communion, given forth. When we had all completed the drinking of the herbal brew Carlos called out “Now! Smoke your tobacco!” Those of us who by choice smoke lit our hand-rolleds or pipes and proceeded to pray with that most ubiquitous of indigenous sacraments: tobacco. Tobacco, when utilized as a sacrament, assists one in establishing commune with the Spirits and carries our prayers forth. Fervently we each prayed, as it is a most common experience for any person, no matter how staunch and brave, to have some trepidation prior to stepping into the always-unknown territory of the Soul’s domain. Just about the time that our tobaccos were completed Carlos let us know that it was all right to lie down. This was a welcomed instruction, as I was beginning to feel the onset of the initial psychedelic body-felt sensations of life force streaming through my body accompanied with a mental expansiveness and a definite ‘wah-wah-wah’ of sound pervading my awareness. A few of us went into the adjoining tent to lie down, while some remained in the tent with Carlos and Gilber. As the sensations intensified the initial anxiety slipped away and a great awareness of goodness, of rightness, washed over me. I relaxed into this state of well-being and floated along the stream of consciousness that opened with it. Just as I felt myself being carried away in the current Carlos began to sing. Such a voice! Sweet, clear as a silver bell, his song sent ripples and shivers of ecstasy shimmering through my body, releasing a cascade of colors in my inner sight that exploded into patterns, shaped themselves into tunnels, warpings of time and space. Whoosh! Into these vortices I… wait, no longer did ‘I’ apply, somehow… into these vortices Awareness snowboarded through the cascades of light beyond imagining, densities of form more distinct than the forest around me. And all the while Carlos sang and sang, endlessly singing Awareness into the dimensions of the Unknown. As his song (a mere few minutes in duration!) faded into a whistle the experience of bliss in having come to this place of being enveloped my Being. It seemed that a wave of nausea had swept through our small group. I heard one member off in the bush releasing his stomach, loudly. We had been forewarned that Ayahuasca has the tendency to cause one to purge. This in mind, and the added incentive of yet another camp member bolting for the trees and vomiting caused my stomach to churn. I lay there for a while fighting the urge. I was in sheer discomfort. A realization came upon me that there was absolutely no need to resist the urge to purge, indeed it was to be expected and was, by the words given before we began, a good thing. The release of the stomach’s contents was a mechanism to aid in the release of the toxins that had been driven out of the cells by the potent brew we had drunk. In addition, we were told, when we threw up we would also be dispelling the negative forces that had overtaken our Soul, be they fear, aggression, grief, anxiety, whatever we each unto ourselves had held onto in our lives. Enough! I crawled from under the mosquito-netting tent and stood upright in the darkness. I turned on my LED flashlight and immediately shut it off. The imposition of something so… foreign… caused me to shudder and stumble. Roberto, lying in his hammock, spoke a gentle word and guiding hand (no doubt so that I wouldn’t crash on top of him!) and I found my way down the slight hill behind our camp. I had traversed this terrain earlier in the evening, actually, in preparation of just such an inevitability. I had even chosen a spot where I could safely kneel on all fours, away from the layers of leaves that were to be found all about, and, intentionally, a place where, therefore, those big stinging black beetles were not likely to be hiding! Scuffing a depression in the soil I leaned forward and released. I coughed. The cough rolled into a gagging roar. Then, from deep within my belly something dark and malicious was discharged. My whole body shuddered, shook uncontrollably, wretched more and expunged the Soul of a harboring immensity of ill. Now, one might expect an explosion of colors and intensification of the psychedelic experience to have followed. Not so. A deep calm, a peace of ages missed, settled over me. I collapsed into a fetal curl of extraordinary comfort and lay there for quite some time in the cuddling embrace of the deep Amazon forest. Ahhhh! I arose, fulfilled from the experience, and began to find my way back to the tent. As I took my first few steps back up the hill I saw a large white spider-like being come moving swiftly down the hill towards me! “Howdy”, I say. It is one of our crew, attired as his momma had birthed him. I smile. Freedom. It is wonderful to behold. I slip back into the tent, met with the caring greetings of my fellow sojourners, asking if I am all right. Yes, just fine, I reply. The rest of the night’s journey was a peaceful riot of color and soothing rills through my body, especially when Carlos would sing, as he did throughout the ceremony. Uneventful is not a word to be associated with Ayahuasca. Non-dramatic, perhaps, and just fine with me. As the experience began to wan a joyful, even silly, interchange began to occur between us journeyers into the Realms of the Soul. We could laugh with ease over our challenges, and excitedly shared of our Visions. We had been engaged by the Ayahuasca for about four hours in this 3-D world. This meant that it was maybe 1:00 AM (do you really think any of us had a watch?!). We, one by one, slipped into a deeply relaxed and recuperative sleep, awakening a short time after sunrise feeling fully rested, energized, and hungry. Breakfast was prepared by Gilber and Roberto, a breakfast of fruits and coffee. Now, I must be clear on this: I said fruit, then coffee, because Peruvian people do it that way, and simply cannot grasp that we North Americans drink coffee before eating! 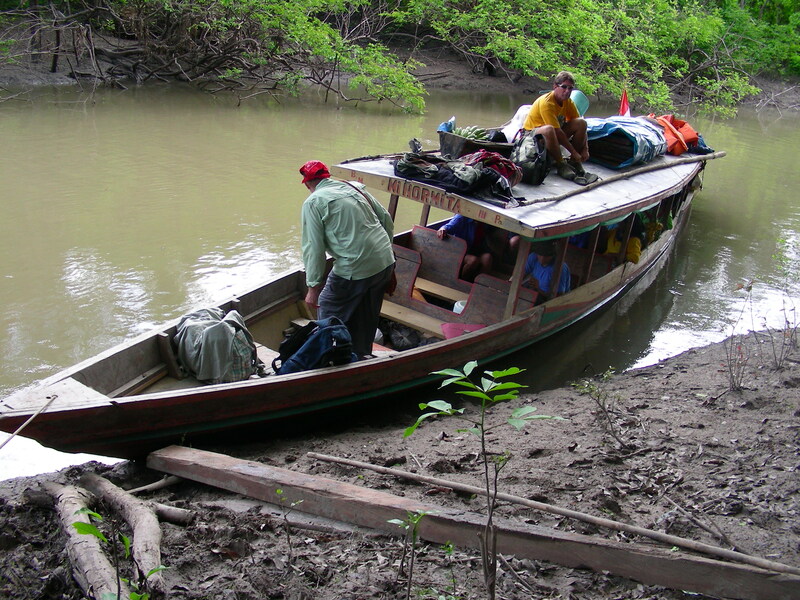 Tents taken down, gear stashed in the boat, we set forth upon our third day’s adventure in the Peruvian Amazon. Our boat chugged its way up stream as we settled into the pile of stored gear and wooden benches. The awning over our heads protected us from the blazing equatorial sun. Even I, who have a skin toughened by years of living outdoors, put sunscreen on. The cooling breeze created by our movement upon the water prevented the ever-present mosquitoes from alighting. We passed by, almost as a matter of course now, a myriad of macaws, monkeys and butterflies. Gilber, always the gentleman, was ever at ready to slow the boat for an astounding view, photo opportunity or to stop for a shore call. We began to see others upon the river; Shipibo men, women and children in canoes carved of a single trunk of palm. The distinctive bright colors of the women’s blouses appeared like flowers upon the water. The jet-black hair of all was shaped in a bowl-cut with straight cut bangs across the forehead. A few outlaying homes, their thatched angular roofs perched over wooden floors supported upon stilts began to appear as we came closer to one of the 24 Shipibo villages that were situated throughout the river banks of the region. As we drew closer to the primary village a large satellite dish was seen to be perched upon a roof! Alan, our journey guide, told us that it was for radio communications between the various villages, not for TV. We put-in at the dock in the center of the village and debarked. Alan informed us that we had come here to avail ourselves of the richness of embroidery and tapestries that are the hallmark craft of the Shipibo people, and that the prices were very reasonable here. He warned us, however, to refrain from purchasing any items from individuals that might approach us as we wandered the paths of the village, that we were to wait and purchase goods only at the tribally designated meetinghouse. 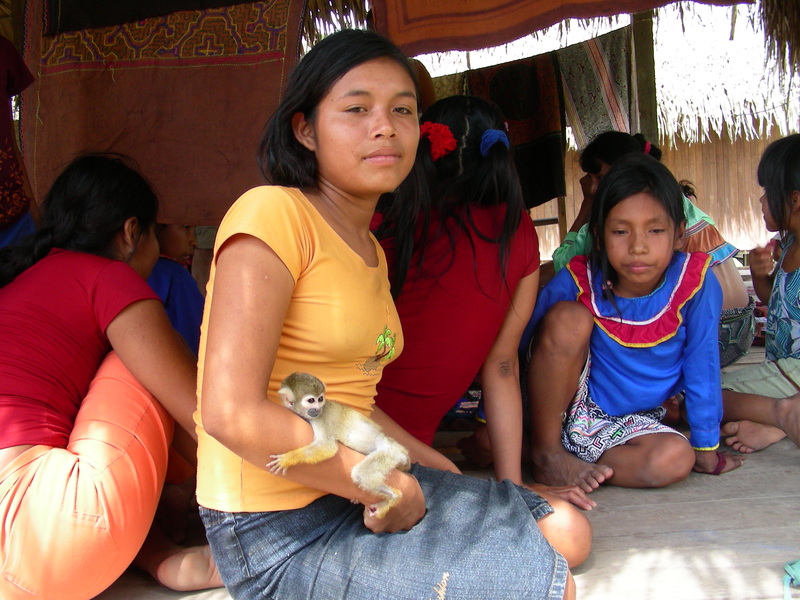 The Shipibo, he explained, have an almost childlike attitude, and therefore they are very innocent in their outlook, but also very jealous and easily take offense. Well, despite this guidance, of course, it was hard to resist the approaches by these wonderful peoples holding out their cloths, and some succumbed to the immediacy of the sale. As a consequence, by the time we had all gathered once again at the designated meetinghouse there was an uproar of accusation amongst the various craft sellers about those villagers who had taken an unfair advantage and sold to the visitors before all had had a chance to display their goods for sale. Alan did quite a fine job of assuring the villagers that we were all intending to buy plenty still, that there was no need to fret. Amidst the entire ruckus one of our journeyers asked aloud “Shipibo. Shipibo. Somehow that name is familiar to me. Alan, weren’t the Shipibo notorious as head hunters?” Alan, deadpan, replied “Yes, but there hasn’t been a reported case in the last ten years.” A slight chill blew through our group, bringing home the seriousness of not paying due attention to the cultural customs of these peoples. Purple hands shuffled cotton fabrics before our eyes, showing us the unique designs and skills of each artist. 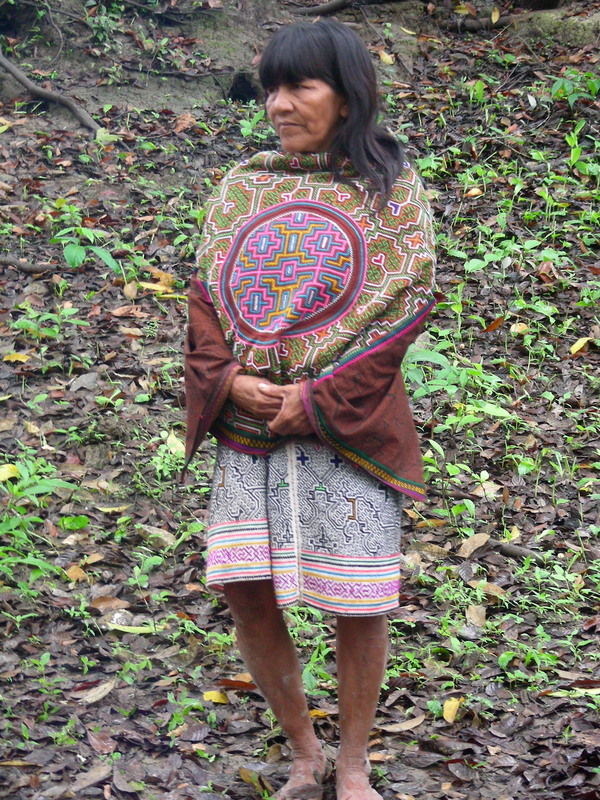 The Shipibo use a dye made from the bark of the mahogany tree to paint upon their fabrics. Continual preparation and use of the dye has stained the hands of the artisans a rich and deep purple. The embroidered cloths the Shipibo offered for sale brought an immediate smile of recognition to our group. There, before us, woven upon the fabric were the very same colorful patterns of our previous night’s Ayahuasca journey! With former head hunting Shipibo tribal villagers who stood barefoot, dressed in clothing made of their own fabrics, broad white toothed smiles, cropped black-haired bangs, purple hands holding forth tapestries of Ayahuasca patterned embroideries, gathered beneath a thatched roof next to the Ucayali River deep in the Amazon jungle; there we were. Who was president, and why? Were there really drive-by shootings on the freeways in some far away place called the USA? Did people really stress over their neighbor parking in one’s favorite spot on the street? Already such insanity seemed to be just a bad dream, and yet we were but three days life lived away from the absurdity we had come to know as normalcy, a reference point of ‘normal’ that was to be forevermore departed. We all sorted through the fabrics, some made into pouches and carry-bags. Foot-square embroidered cloths; shawls and tablecloth-sized mahogany painted intricacies were chosen and bought. The prices set were gladly paid, without haggle. These people worked hard to produce these fine goods, and the monies asked were but a small amount in comparison to the value of these items in North America, were they even to be available at all. I wandered over to a group of men who were attentively sawing a log into planks. They had a Volkswagen engine with a pulley set on one axle, to which was strapped a long belt that rotated the shaft of a large many toothed circular saw blade. The men gauged the thickness of each plank to be cut by means of a guide made of a length of wooden stake hinged to the frame with a nail. This functional guide was flipped towards the log’s flat cut edge, insuring thereby that the thickness of the plank being cut would remain of equal thickness, about 1.5 inches. The log itself was set upon rails made of wood, the log being chained to the rail to prevent it from slipping. The men would push the log bedded rail forward towards the whining blade. I was thoroughly fascinated by the ingenuity born of necessity that these villagers had utilized to develop a minor sawmill to ease the cutting of planks for the variety of their needs. Everything from boat building to flooring required the use of these hand cut planks. Okay, it is a guy thing, but an integral part of the Amazon experience nonetheless! Re-boarding the Normita, we now turned and went back downstream, passing by our campsite of the night before. After an hour’s ride we turned up the riverway from which we had veered the day before. Our journey now took us up the river for another seven hours. Once again our boatman would steer the boat through alleyways of swamp and channel, cruise upon the turbulent waters of the river, through the wide swaths of calm and slow moving currents and all the while pointing out the amazing features and unique sites of this varied landscape on either shore. More pink dolphins joined us, and were almost always visible at some distance from our boat. Gilber entertained us with stories of mermaids said to inhabit these waters, of how they would grab the hair of women bathing in the shallows next to the shore and pull them under water, taking the women to dwell in their underwater villages. Other stories were told of male dolphins who would shapeshift into human looking men, pale skinned, that would come into the towns and villages and seduce the women, leaving them to bear distinctive and strange children who were also pale of skin, and these could even still be seen to live amongst the darker skinned native peoples of the Amazon. The mermen still retained their breathing hole atop their head, it was said, and so they could be discerned by the straw hats they always wore upon their heads when they appeared in the towns. Hmmm… light skinned, hat wearing men who mysteriously show up in town, seduce and impregnate the women then just as suddenly disappear. I removed my straw hat when in town after that! Afternoon brought us to our campsite for the next two nights. We had long since been traveling up a smaller river that twisted and turned with the vagaries of the landscape and carved channels of eons of torrential rain. When Gilber guided the boat to shore it was upon a sandy bank that had palm trees overhanging. We climbed the small incline and stood within a small clearing. A dilapidated thatch roofed, open sided hut was near buried in the weeds. This had been our intended lodging I later learned, but Plan B was in effect due to its disrepair. The jungle is quick to reclaim its own. Roberto and Gilber set to mowing the grass with machetes… an art in itself, believe me! In short order they had cleared the grounds and set up the mosquito netting tents. We camp members explored the surrounds and discovered more thatch roofed buildings further along the trail that led into the forest. These were on someone else’s property, and were not to be ours for camping. The grounds on which we were to camp belonged to a friend of Carlos, our Ayahuascero. The friend had given permission for Carlos to utilize these grounds for such purposes as we were to embark upon. The land, it seems, had once been a productive farm, growing bananas and coca, but now lay fallow. Gilber and Roberto had set out to eat some rice and chicken and the ubiquitous short bananas that were a part of every meal served us. Bananas ricos, Gilber referred to them. The rich sweetness of their taste, especially after being fresh roasted inside their peel, was indeed a rich and potent flavor, as the name indicated. We were again cautioned by Alan to avoid eating much, if at all, so as to prevent later stomach upsets. I opted for having something in my stomach, in case of nighttime upheaves, rather than risking dry heaves, and so ate lightly, as did some others. Having eaten I went for a walk along the trail going away from the river. Again I scoped out a convenient location for calls of nature, should it be required during the night. A large stand of banana trees revealed amongst them a suitable small clearing. Evening fell swiftly, as it does in the equatorial Amazon, where every day is evenly divided into 12 hours of light and 12 hours of dark, a land of perpetual equinox. We were told that, as the night before, we would begin our ceremony about 9 PM. As it was only about 6:30 this gave ample time for a nap, to which I availed myself. An hour or so later, refreshed, I rejoined the other members of our group, some of whom were also just awakening. We sat and smoked tobacco, chatted and joked about our situation, anticipating the inevitable beginning of the night’s adventure. The cry and call of the denizens of the deep jungle increased with the full darkness of night. A beautiful symphony it was, and comforting. We heard Carlos begin his eerie blowing whistling sound, and thus knew that the moment was upon us. We entered the tent and once again repeated the ceremony of the night before. Carlos measured our portion of potion and dispensed it to us each. One of our group chose to abstain for this night. Gilber spoke regarding the sacredness of what we were doing and encouraged us to be purposeful about our intent. This night, as well, when Carlos began his singing, Gilber joined in, and even at times sung on his own. We all smoked our tobacco and laid down at Carlos’ direction. Truth, Knowledge and Understanding were the intent I had set for myself this night. The sensate experience of the onset of the Ayahuasca washed over me. If, by analogy, I were to describe it, the sensation was as of a loosely stretched rubber sheet with a marble placed upon it. As the marble rolls around the sheet depresses. Imagine now that one’s Awareness swirls, in a spiral fashion, towards the center of the cone-like depression created by the marble. And now further imagine that the marble itself is moving about the surface, so that one’s Awareness is in an ever-changing state of flux. Now, as the depression extends into a funnel shaped tunnel, Awareness, with ever increasing speed, spirals down and through the tunnel. Consider then that this tunnel somehow curves back upon itself, as in a torroidal doughnut, emerging into another dimension. This was akin to the opening moments of sensation as the Ayahuasca carried me into its embrace. Spectacular colors and patterns emerged, multi-dimensional geometric patterns the color and hue of which is beyond human descriptive capabilities. Through the suddenly appearing and transfiguring tunnels of perception, dimension to dimension, Awareness flowed, dropping eternally, endlessly, through the myriad complexity of pathways. There came stillness, a stillness that was more total than the time I had spent in the lava tubes of Mt, Shasta some years before. The silence and darkness were complete. Within this silence I began to notice, to feel, the presence of… Others. Extrasensory perceptions honed in on the presence of these Others that seemed to be lurking in the darkness, seeking to discern their nature and intent. Klieg lights of psychedelic enlightenment burst into being, revealing the Others in a manner from which there was no hiding: the Others were myself. Every attribute of my Soul in its archetypal form was there revealed. Each moment of love and pity and greed and joy were present. I was standing in the presence of the Truth of my Soul. Once my attention was fixated upon any given archetypal form that specific presence was made known to me. Every quirk and tweak of my nature, all the fulfilledness of exaltation flooded into my Awareness, respective of each inherent essence. Once my attention was focused upon a given archetype, its contents immediately flooded into my awareness. Where there was any emotionally charged content, such as fear, guilt and shame or, conversely, joy, beauty and exaltation, I was fully engulfed in its experience. And once released the powerful sensations and images, memories and feelings were there to stay. Unless… once met, the discomforting and dysfunctional negative emotions were contended with through compassionate forgiveness, then the disempowering emotionally laden charges dissolved, and in their dissolution, became waves of love and shivers of ecstasy! Not that this was an easy task, to forgive one’s own self, nor was a mere whim of intent sufficient to release the judgment and anger held towards those who had transgressed upon one’s self. Sometimes it became an excruciating struggle, knowing that I must release the attachments to be free of the grip, experienced directly and in a sensate manner with immediacy, that had wrenched my Soul. But once released, Oh! The flood of freedom and release that became my Being was an inspiration to go forth with courage in meeting each archetypal merger that was to come. My body shivered, muscles twitched, spasms wracked my tissues as the release that had come spiritually now exited my flesh. My body jumped and shuddered and then it was done. In the midst of the denizens of the darkness of my own Soul I began to notice a peculiarity. There were a significant number of archetypes that merged in presentation and yet there was no content therein. The realization came over me that in those instances there was no negative charge of emotions associated with that specific essence. These archetypes integrated with ease and fluidity. It was then that I began to understand the process that underlies the phenomenon. The archetypal forces were in a state of motion, a movement released from the bonds of self-control that would otherwise be maintained through repression and denial. Certainly not a desirable state for every-day functioning, but then, this was far from the everyday world. This was a world of deep self-reckoning, and it was an opportunity to dive in and do the clearing of my Soul that was exponential in proportion to the quiet moments of inner reflection that was, in the best of times, the daily recourse of dealing with my ‘stuff’. I dove. Years of backlog purged, and yet I felt not the slightest stomach lurch this evening. A pleasant comfort, this. After some time of the archetypes rolling through my awareness, these too passed and a beautiful peace came over me. I say ‘peace’. I mean something so beatific as to be beyond words of mere description. And in concert with the spiritual state experienced was a concomitant suffusion of colors and angelic music rippling the very fibers of my Being in orgasmic rapture. Every sense was energized as if a bolt of bliss lightning was firing the totality of my nerves into ecstatic eruption. 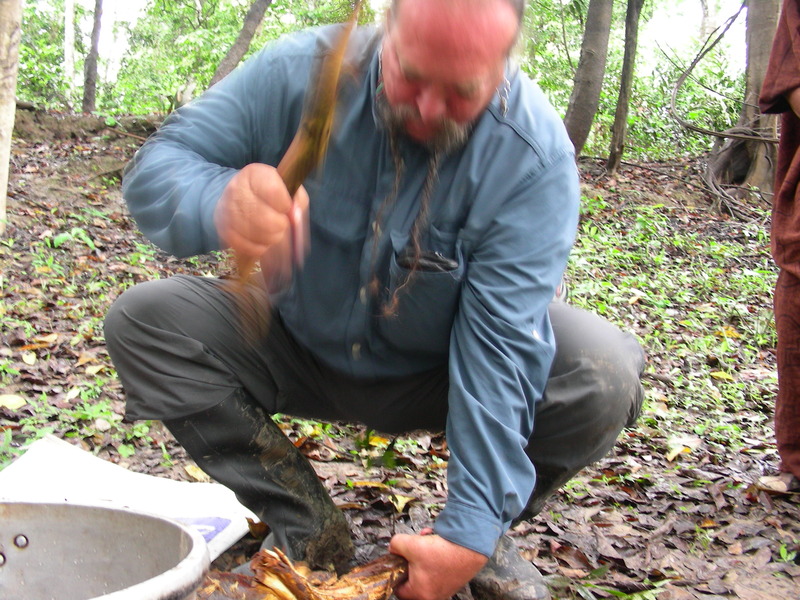 The Ayahuasca drifted away from the 3-D world back into its most holy of domains. Looking into the sky above me the stars were like dewdrops upon a spider web, each point of light connected by a silvery string to one another. I recalled how, in the midst of this night’s journey, there had been present throughout a sinuous movement approaching, moving through me, being a part of me. When Carlos asked, the next morning, if I had met the serpent, I had an immediate Ah-hah! And said that yes, I had. He smiled and nodded his head. All us sojourners of the Soul lay in the soft warm afterglow, sharing of our visions, laughing at the slightest thing, a love pervading all. We had been into the Other Realms and come back with our stories to tell. We shared a communion, even the same experiences at times. Slumber came drifting in like a fog, and a deeper sleep I could not remember. Morning, for me, came with the sun already above the treetops. We had somehow convinced the Peruvians that we North Americans really did drink coffee before eating food, and they complied with our strange wish. Ah! Hot black coffee, a tobacco and the brilliance of a new day, all enjoyed sitting on the banks of the river, chatting with friends and making plans for the day. Gilber and Roberto set off in the dugout canoe. They paddled about a dozen strokes, gaining speed, and then unfurled a home made net into the water. A few more strokes trolled the net fully behind them. They then brought the dugout to a halt, turned around and paddled back towards camp, pulling in the net as they did so. Once the net was pulled they emptied the load of slapping fish into the boat’s floor. Smiling proudly the men hoisted the fish to shore. 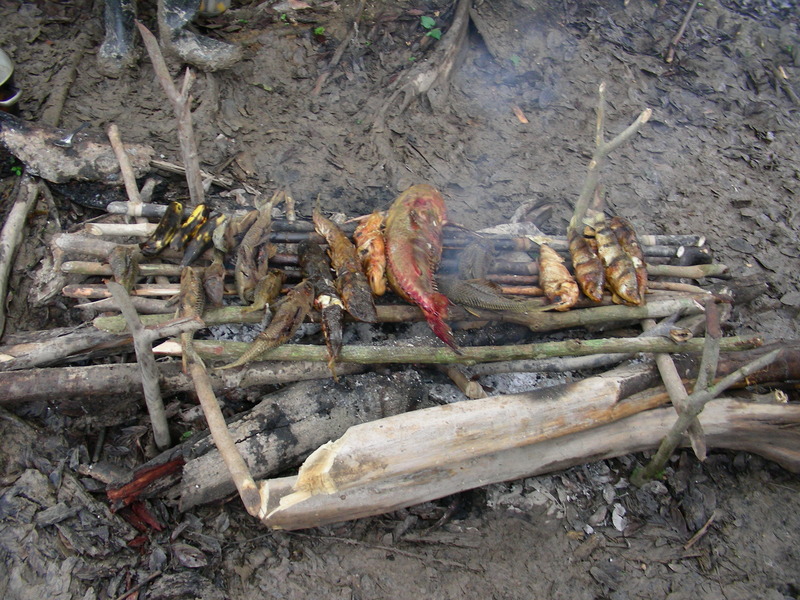 A full days supply of fish for our meals, straight from the Ucayali, had been gathered in a matter of five minutes or less! Some of these were roasted upon the coals, along with the short sweet bananas, and there was our breakfast. Sitting upon a log eating breakfast, Carlos comes and sits as well. He waits till I’ve finished eating breakfast, smokes his pipe as I roll a tobacco, then says “Tell me of your place.” Hmmm… I begin to describe Sedona, Arizona. The towering red rocks, vast deserts and trickles of streams called rivers with a greenbelt extending a 1/4 mile on either side of the water. He has a look of profound incomprehension on his face and it isn’t just from my poor Spanish. Ok, I think to myself, what is going on here? I put myself in his place (which I am, literally!) and realize that there are no rocks to bed found, everything is compacted silt washed down as erosion from the far distant Andes. This man lives in a plateau of water; water everywhere, and dense tall green trees and grass and shrubs wherever one goes. How to describe Sedona and the desert to a person for whom there are no rocks? Being Shaman, and Carlos being Shaman, I do what Shamans do: I build a sphere of Power and invest it with the image of my home area, with the feeling of a dry heat, torrential rains in the summer, snakes and scorpions, deer and javelinas, cactus and blooming yuccas, ever clear blue skies and starry nights. This is then passed into his field, as I once again describe each element. Carlos smiles, nods his head and I can see that he ‘gets it’ as he comments, “Oh, it is a very beautiful place where you live.” “Yes, very beautiful,” I respond. Carlos then looks thoughtful and asks: “In the place where you live, are there mosquitoes?” I pause in consideration of this. Relative to the ever-present swarms here in the Amazon, the quantity of mosquitoes is absolutely negligible. I answer, “No, not really.” Carlos’ head tosses backwards in a state of ecstatic awe! To imagine that there exists a place without mosquitoes is of such awe and wonder as to be an experience of ecstasy itself! Being a Shaman, and therefore a man of the moment, Carlos’ composure returns quickly and he moves on to the next consideration upon his mind. He asks me “Thos boots you have on. Did you bring them with you on the airplane from your place?” I saw immediately where this was going, and let it play its course, as dignity dictates. “No, I bought these here in the Amazon.” The boots to which he referred were mid-calf high black rubber water waders, excellent boots to keep one’s feet dry, and critter-proofed, while traipsing through the swampy backwaters of the Amazon jungle. “Are you going to take them back to your place with you?” he continues. “No, Carlos, my land is dry, I will give them away to someone here in the jungle.” Without the slightest bit of neither unease nor entitlement, Carlos simply asks “May I have them when you go back to your place?” I reply “Carlos, it would be my honor to give these boots to you when I leave your place.” He nods, and then asks for a drink of water from another passing by. And so it goes, there in the Amazon. Those boots were to serve me well, still, that day. Antonio, the farmer upon whose property we were camped, came by and spoke with Carlos and Gilber. Old friends met well, it seemed. Antonio had come to tend his farm that was upriver a bit. Carlos asked if I wanted to go see his farm. You bet! A chance to see some of the local ways-of-being was always a welcomed opportunity. Steve, Gilber and I set forth along a trail that led upriver. At times the trail was wide and dry, other times it became a slog through swampy bogs, with occasional logs laid down to walk upon when the bog or water was particularly treacherous. Always on the lookout for snakes (I really was looking for them, hoping to see one of the renowned anacondas or boas of the district), a found pole in my hand to steady myself while walking along the log, or to probe the swampy trail ahead of me to gauge its depth, we proceeded for about two miles. Into a drier opening, obviously having been cut from the jungle, we entered the farm. There were banana trees in abundance, and pineapple bromeliads, some in fruit. Gilber showed me then some bushes, ten to twelve feet high, covered in a bright green leaf. “Coca.” He says, “Please gather some.” Steve and I gladly accepted the offer. Coca leaves are highly regarded by all the people of Peru. It is a nutritious food, a mild energizing stimulant and one of the most revered sacred plants amongst the Peruvians, chewed by one and all throughout the land. In the high Andes, where people dwell up into the altitudes of 16,ooo feet and more, the leaf of the coca is utilized widely for its alkaloid properties that make the blood more accessible to the available oxygen, necessary to maintain adjustment to the extreme altitude. We gathered, chewed and returned to our camp. Alan informed us, upon our return, that it might be best to limit the chewing of this particular leaf, as the year before the USA military had sprayed the region with dioxin containing defoliants as part of their campaign against growers of the leaf. This event had sparked massive street protests, emissaries of the Amazonian indigenous peoples went to the capital of Peru, Lima, to protest the destruction of their farms, the poisoning of their families and the resultant inability of the people of the vast region’s ability to grow their crops. Carlos brought out his gathered herbs and vines. He began to pound upon the liana vines with a wooden club, mashing them, breaking the bark apart. Carlos was quite a sight, dressed in his traditional gown of cotton that was dyed with the intricacies of Ayahuasca patterns, squatting there upon the jungle floor, smoking his monkey-bone stemmed jungle pipe of jungle tobacco, swinging away with a rapid precision as he sang quietly to the herbs that he was preparing. Filling the pot with water he then set the mixture on top of the fire he had previously built. When finished he had quite the pile of shredded vines. This he put into a large kettle containing a large quantity of chakruna leaves. The herbs boiled for a good number of hours until, by his discerning eye born of years of experience, he proclaimed that the Ayahuasca was brewed. When it had cooled sufficiently Carlos poured the brew into a 2 liter bottle. It had the same color as that of the river upon whose banks we sat. The day had grown hot, the humidity squalid, aggravating our numerous mosquito bites. We had been using Amazon bug repellant; fresh lemons cut open and the juice rubbed upon the exposed skin. Mosquitoes, we learned, were primarily a fruit feeding critter, sucking the sweet nectar from the fruits of the region. To them we were nothing more than a blood fruit. The Amazonians have a distinctive manner of contending with the mosquitoes: they keep a handkerchief in hand, always swinging and swatting, creating a non-rhythmic field of movement, keeping the bugs from alighting. Afternoon came and the heat was stifling. We all, us journeyers, followed the trail to where, about a 1/4 mile away, there was the homestead of the farm set upon a beach of sand. Stripping down to our shorts we dove into the water of the river, relishing in its relative coolness. Swimming and sunning, swimming and sunning, we wiled away the afternoon. Not a care in the world, not even a word mentioned of the travails of terrorist nations battling terrorist groups battling innocent people around the planet. Ahhh! Our daily wear clothing had become rather dirty and sweat soaked. These were washed in the camp manner: worn into the river, then taken off and laid out to dry upon the branches of nearby trees. By ones and twos and threes we made our way back to the campsite. A light early meal of beans, rice and fish had been prepared. Some of us chose to eat lightly, then we settled in for naps and shade-covered respites. Evening set upon the land. With it came a coolness, but also a rise in the incessant buzz of mosquitoes. This was the dry season, we had been told. However, a major rainstorm had come through two weeks before our arrival and this had increased the mosquito reproduction cycle out of proportion beyond what was normal for April. As we each awoke, or returned from a swim or hike, we gathered, the camaraderie between us firmly bonded by the shared experiences of our journey so far, an adventure which still had mysteries as yet to unfold. Carlos’ whistling drew us into the tent, there to embark upon our next Ayahuasca journey, the third of our Amazonian sojourn. We arrayed ourselves comfortably about Carlos and his altar. Again he sang the songs of awakening the Spirit of the Ayahuasca. The familiarity of the ritual engendered a sense of peace, a calm acceptance; something unknown to me before in my history of engaging psychotropic plant medicines. As the brew, freshly made today, was gulped and prayer tobaccos smoked, setting intent for the nature of this night’s journey, strength was born of the comfort. For myself the prayerful intent set forth was one of coming to know the Spirit of Ayahuasca and the embrace of blessings. Lying down with my family of fellow frequenters of the sacred quest within the Soul, the sound of hungry mosquitoes played like a symphony of cacophonic vampires upon my nerves. Only inches away from our head, separated by the merest veil of meshed netting from our tender flesh, the world of the pests was insistently louder and more voracious than the previous nights’ visitations. Whenever a hand might move to a closer proximity to the netting than usual the mosquitoes would vociferously increase their agitated volume, seething and poising for the hoped imminence of contact with exposed skin. We found that we could create a sort of rhythmic cadence by the purposeful brush of a finger against the netting, causing the critters to converge and probe with increased buzzing in those brief moments. The expectation of having, at any moment to come, a swift shunt into the Other Realms brought a curious feeling of anticipation. However, after quite some time had passed a few of us began to query each other as to whether or not we were yet experiencing the onrush of expected sensations that would indicate an imminent transition. Philosophically, some felt that the lack of intensity of perceived sensations were perhaps the norm for having sojourned twice already in the short span of the two nights previous, and that the third would of course be more attenuated. I had my doubts, but held my voice, each of us needing the assuredness of our own convictions in such situations. It simply felt, to me, that the dosage was insufficient. Some time later Gilber and Carlos came around, asking how we each, by name, were doing. It is a welcomed consideration to have the ceremonial leaders inquire in such a personal manner. When Gilber asked me what was happening, I responded “Nada (Nothing).” He replied, asking if I had yet journeyed. “No. Nothing has happened.” I answered. Gilber then asked if I would like another cup of brew. “Yes!” I enthusiastically answered. This was exactly what I felt was needed. Carlos poured another gourd of juice, prayed over it, handed the gourd to me and I drank. He then squatted over me and blew a large puff of tobacco smoke over my head, quietly speaking to the Spirits as he did so. After attending to the others, offering more brew to each, some of whom received, while others were okay with where the Ayahuasca had brought them already, Carlos began his sweet and enticing singing, the sound of his gourd rattle sharp and distinct in the jungle night; sch-sch-sch-sch -schah, sch-sch-sch-sch-schah. Moments later I felt the familiar buzzing sensation of the onset of the Ayahuasca coursing through my body. Wafts of color swept around me, swirling, twirling in Mandelbrot patterns. Galactic spirals rushed towards me. As they passed through me I was fully aware of each star within the galaxy, and of each planet spiraling about each home star, and of the Beings living there. Darkness, eternal Darkness, void of form engulfed my Awareness. Realms of light, amorphous and infinite permeated my Being. Distractions, that’s all these were, for all their beauty, mere distractions. With this sensibility came a collectedness of perception. The tunnel effect of previous experience drew me in. I dropped, endlessly, endlessly through the torroid. Through this vortex I dropped and then came into the Stillness. Senses fully engaged, I felt into the discomforts that were bubbling up from within this state of awareness. I was acutely aware of the persistent niggling attacks of fear that would run their course, like the Bulls of Pamplona, running over anything that stood in their way. These particular fears had to do mostly with my fatherly worry for the safety and well being of my children. Worry is just a negative prayer, and even knowing this, still sometimes these fears, even if minor and controllable, would well up from within me. Control of fear is not the same as being liquid to it, however, and so I had been in constant attention to clear the surges of worry at their first sign. But, their persistence was annoying. Not necessarily neurotic or overpowering, just annoying. There were also other niggling nabobs of negativity that would occasionally surface. All these, while individually no big deal, in composite comprised a sullen chunk of my Unconscious that therefore did not abide in peace. It was time to deal with this. The presence of the Sacred Serpent made itself known as I set my sincere intent on resolving these conflicted states. No mere wiggling critter presented itself, however. Poised above me, towering, was the immensity of this archetypal force that coalesced into the image of an anaconda snake. Colors rippled, patterns singularized into the holding shape of the Sacred Serpent. I spoke with the serpent, asking what could be done to free myself of the aforementioned debilitations harbored within my Unconscious. “Were I to assist you in their release,” she asked, “what would you have take their place?” This question settled within me. Without a ‘’thought process’, I responded: “The weaving of peace and harmony.” The Serpent gauged me, her eyes peering into my very essence. “Send your fear to me” she said. I gathered together all the bits and pieces of the nagging distortions, bundled them and tossed them up to the Serpent. She caught the bundled fears in his mouth. It appeared to me, this bundle, to be as an egg between her jaws. I was aware simultaneously of two things: one, that there was a vortex, a portal into the infinite on-existence of being, next to the Ayahuasca Spirit/Serpent. The other was that, somehow, what I had just offered her was a paltry copy of the internalized fears, not really the fears themselves. She spat the egg into the portal of infinite dissolution and spat at me with her words. “I don’t want THAT.” She declared. “I want YOU!” I backed away in utter disbelief and fear. “Now wait a minute!” I cried out. “I didn’t agree to that!” The Serpent looked at me with a look of disgust, and then said, “What’s the matter, don’t you yourself wish to be the Weaver-of-Peace-and-Harmony?” “No, I have more to be and accomplish than just being the one thing.” I called back. But even as I did so, I knew that I was full of it, I was sidestepping, ducking and dodging. My ego, and its fear of obliteration, was rearing its own humongous head, putting forth rationales and justifications for not stepping up to the plate. I knew that I had just been called on my BS. Still, I struggled in the grasp of my ego’s iron hand for perhaps a half-hour, my body twisting, writhing, and shuddering in reactive disavowal of the obvious truth. Finally I could bear it no more, I was exhausted, broken, no excuse put forth led out of the predicament the Serpent had placed me in. Crumbled, humbled, I accepted the requirement of the Serpent. “Yes, I give myself fully.” The Serpent leaned down, grasped me in her mouth and swallowed. I slipped into the vast Nothingness of ego-obliteration. Peace. Harmony. Yes. My mind kicked in. “Now wait a minute. How do I know if this is really real, that all these fears have been dissolved? How do I know that this isn’t just a trick of the mind to avoid having to deal with these imbedded nagging worries?” Geez. Okay, valid point. How do I know? I tossed this about for a bit, then went to the Serpent once again and presented the quandary to him. He looked at me with a disdain and an exasperation that a parent may have for his recalcitrant child. As he looked at me, piercing me with his gaze, an awareness flooded my Being. There was a star of the most intense and vital blue. And this star was a flower of the same color, brilliant and blue. And the flower was itself indistinguishable from the single drop of nectar-essence that dripped from the blossom, the drop of fluid the same intensely beautiful blue as the star and flower. It fell towards me. I know, in a manner that I did not know how I knew, that should this drop of nectar touch my forehead, that I would reside in the absolute knowingness of the veracity of the experience. In that same moment the star/flower/nectar touched my forehead and… the tree under which we were camped ‘squished’, an audible sound, and we who lay upon the ground were sprayed with the liquid released from the tree…at one and the very same moment as the nectar, in the Vision, touched my third-eye! My body sat bolt upright with a loud exclamation of “Whoa!” I excitedly communicated with my fellow sojourners what had just transpired. A keynote of Shamanic ‘magic’ is the convergence of the internal and the external. While it is not an experience that, in our Shamanic practice, is rare, it is always profound, each and every time. Meanwhile, we were all wondering what had caused the splashing we all had felt upon our bodies. The stars were clearly visible above us, so rain was out of the question. We had each heard the audible squish, but had no way of accounting for even that. Some thought that maybe a monkey troop had moved into the tree and had urinated upon us. We even searched the tree. No monkeys were to be found. As we were searching for an answer, the there was the squish once more, and another shower of liquid upon us. I tasted the droplets upon my skin and found them to be somewhat sweet (definitely not monkey piss!). The mystery remained a mystery, welcomed and somehow comforting to us all. Throughout the rest of the night the tree beneath which we lay continued to splash us with its sweet nectar. As we lay there in the mosquito webbing tent we each continued along our own and unique pathways of self-discovery, transformation and bliss. At one juncture I asked Alan, who was stretched out to my left, how he was doing. He responded that he was searching for the way to effectively release the ‘Little Alan’ (we all know the “Little Me’, the one who is insistent in driving one’s life based in old patterns and fears). He then asked if I had any suggestions. I replied rather blithely that once I had figured out how to let go of the ‘Little Jade’, then I would let him know. This, however, was, in my own estimation, not a response worthy of the sincerity of my bro’s request. And so I next said to Alan “Hey. Call upon the Bear, or Snake, or whomever you have relationship with, and feed the ‘Little Alan’ to that one.” Alan lay there silently for a short while, then chuckled and said: “Yeah, that’s Jade for you. If something is bothering you, feed it top a wild animal!” I laughed uproariously along with everyone else, for it is in essence true, my own way of transforming the demons-within. By this time we were all in the rather mellow and easing-off phase of the Ayahuasca journey. Having been limiting of the amount of food eaten for three days, and this being the culmination of three nights of ceremony, a few of out fellow travelers got up and rummaged around the camp kitchen for food. Alan slipped into a dugout canoe and went for a paddle in the river. A few others of us slipped into a deep and peaceful sleep that lasted till just after sunrise. Upon arising we feasted upon a breakfast of roasted rico bananas, fish freshly caught from the river. Now, these fish are whatever happens to come up in the net. On this morning we ate piranha! I am sure you know of the notorious piranha, that in vast schools will strip the flesh from an animal in mere minutes, leaving only bones awash in the water. Well, it was these very same fish that we feasted upon this fine morn. They are a very tasty, firm yet flaky white fleshed meat. Coffee, hot and black, finished off our morning’s repast. As camp was being packed away into the boat we each said our final farewells to the campsite that had become our home, a place of sacred domain. Carlos approached me and asked how the journey of last night had gone for me. I told him of meeting the Serpent. 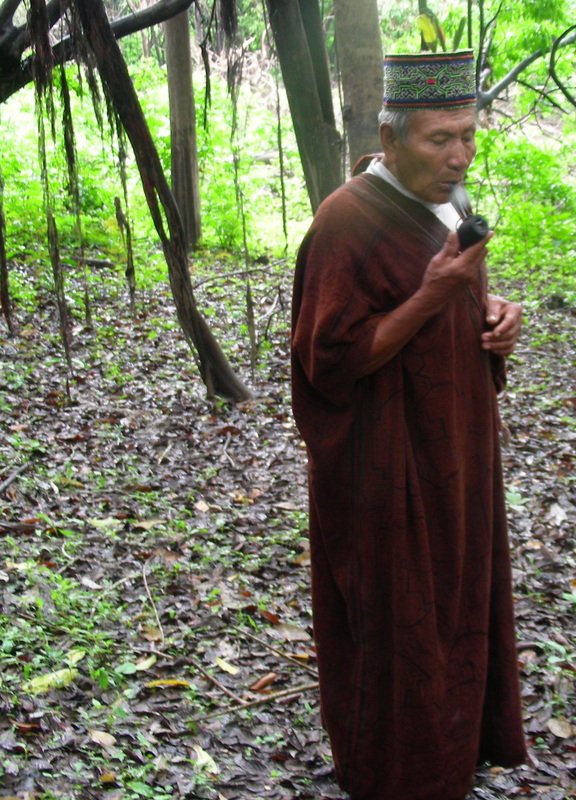 He smiled handsomely, such an experience being the epitome of the Ayahuasca journey for the Amazonian peoples. I then told him of the tree spraying us throughout the latter part of the night. Carlos’ eyes got as wide as his smile, saying that we were blessed by the sacred act of the tree. Though we, in our limited ability to communicate (as my Spanish is only minimal), did not go into this further, it was clear that the experience of being splashed by the tree’s nectar was a sign of great import. As we sat there, talking and drinking our coffee, I passed over to Carlos the rubber boots that I had promised him. Carlos nodded his head in appreciation and slipped the size 10 boots over his much smaller feet. The return trip down the river was much the same as the journey upriver; troops of monkeys, macaws splashing color about with their plumage like an abstract paintbrush dappling reds and blues and yellows amongst a palette of lush tropical greens, the simple beauty of the Amazonian people carrying forth their daily activities on the river’s shore. Gilber spotted someone on the banks of the river, standing silently, unmoving. He pulled the boat to shore and the man upon the bank stepped into the boat with a greeting to Gilber, then Carlos, followed by a nod of the head to all. Gilber explained to us that this man, a friend of his, was ‘hitch hiking’ in the Amazonian style. He rode with us for about two hours, and then we pulled into a shallow spot where a few dugouts were sitting up on the drier ground. This was, we saw, the man’s home. I departed the boat to get a few pictures of these unique canoes of the region. They were each carved of the single trunk of a palm tree, hollowed and shaped. Gilber had gone ashore with the man, but soon returned and waved for me to come up with him. I was touched, as the invitation to go into the family village was, for me, an honor afforded. We had all been careful to not presume, contrary to the seeming norm for many North Americans and Europeans, permission to enter the sanctum of family domiciles and lands. The grounds upon which the homes sat was well manicured, the grasses having been cut short with machetes, as fine as any lawn in the US Midwest. This was to prevent vipers from having a place to hide and pose a threat to the peoples as they went about their daily errands. The houses themselves were built upon stilts, keeping the dwelling areas high above floodwaters. As I followed Gilber we stopped at the base of a ladder ascending into one of the thatched roofed homes. He called out a greeting and was responded to in like kind. Gilber then indicated that I was invited to go on up. As I got to the top of the ladder I found myself upon a platform from which planks spanned to two sides of the house. In the one to the right were a woman and her son. She motioned for me to come in. We conversed but a little. The woman of the house was cooking fish and bananas upon a hearth in the corner. The hearth was constructed of rock and clay, forming a large wok shape. In it was a fire off to one side that provided the coals that were then slipped under the steel grill upon which the food was cooking. I asked the woman of the house for permission to take a photo of this arrangement. She looked at me quizzically, as if wondering why in the world anyone would find her kitchen range interesting enough to photograph! But she graciously agreed, and I did so. I heard a whistle from below as Gilber passed by, so I gave thanks to the woman and her son and descended the ladder from the wood-beamed house. We walked down to the boat landing and reboarded, then set forth down the river. As we went there were large signs noticed here and there upon the river’s edge. They read NO TRAWLERS! Alan interpreted their significance for us. The commercial demand for fish had reached a point where the big netting boats were invading the local fishing areas of the native peoples. This encroachment upon the food supplies of the people of the river was not to be tolerated. Illegal and destructive of the environment, trawlers and illegal logging has had a sad impact upon the Amazon Basin and the integrity of a unique and beautiful way of life. Continuing down the river we sat and watched the scenery, now seen with eyes of reverence and appreciation where before there was the immediacy of newness, as an integral part of our newfound experience of this jungle, this watery world and its inhabitants. As we proceeded one of the inhabitants came into view: a boa constrictor snake swam across the front of our boat! Its head was the side of a one-quart mason jar, its body nearly as thick, supple and graceful, powerful and immense. It was close enough to where I sat at the front of the boat that I clearly could see the black of its body, rows of yellow dots patterning the three-foot length behind its head. The mid-section of the snake’s body was another three feet behind that, arching as it dove beneath the water to avoid the rapid progress of our boat. Wow! And this occurred in the very moment that Alan was concluding the payment arrangements with Carlos. Something very mythical and potent about that synchronistic event transpired. We dropped Carlos at his village amidst many fond farewells, a kinship embraced. A few more hours brought us to La Perla Bed and Breakfast where we resided that night. An exhausted and yet empowered group of travelers we were. A wonderful meal, much laughter and reminiscing concluded our evening. We slept a sleep well deserved. Morning arrived and we set forth by boat once again for the village of San Francisco. There we were greeted by the villagers. They led us to their Main House where the various artisans and vendors had set their wares to be sold. Woven and dyed cloths, pottery, wood carvings, paintings and beadworks, rattles and flutes, embroidered cloth, items of clothing, all laid forth for our choice. And what a choice it was! The plethora of unique art and indigenous materials were each so tempting, the prices so worthy, that our main problem was limiting our purchases to what our already over-stuffed baggage could pack. Carlos brought his family to be introduced all around. He was still wearing those boots. As we began to wander back to the dock to board the boat individuals of the village who had other items for sale approached us many a time. I asked one woman if she had for sale any of the bright and colorful satin blouses, ruffled and sleek, that the tribal women were so fond of wearing. A light went on in her face (as if the realization that anyone had an interest in their own garb had never occurred to her before!). “Si! (Yes! )” She replied, and ran off to her dwelling. In a moment she was back again with two blouses. I had in mind a gift for my daughter, and so chose the one that was most her size. A swarm of women descended upon me, each now offering the blouses, clearly of their own possession, that they brought from their domiciles. I demurred, as I had already purchased the one I wanted. Once more on the boat we headed to the city of Pucallpa for some more citified shopping, purchasing such things as mapacho (the strong black native tobacco), machetes, herbs such as Una del Gato (Cat Claw), Palo Santo ( oh! such a beautiful smelling incense wood!) and… more bags to carry our goods. After a meal we returned to La Perla for a final night’s stay.